It's been kind of "late in the semester" busy, so blog posts have been limited, but it doesn't mean that nothing interesting is happening in the world. Volcanoes in Alaska (how's that "something called volcano monitoring" working out for you Gov. Jindal? ), and now earthquakes in California. Nothing that is totally out of the ordinary, but enough to pay attention to. It started a few days ago down in the Salton Sea area where the San Andreas fault stops. It just ends down in the sand and gravel beneath the Imperial Valley. What actually happens is that the zone of fault movement skips to the west a bit, and an area of stretching resulted in the formation of the deep fault valley (or graben) where we grow our winter crops around Brawley and Calexico. The quakes ranged as high as magnitude 4.8, and there have been 300-400 quakes in the immediate vicinity. The swarm has seismologists a bit concerned, as this is a part of the San Andreas fault that has not produced a major earthquake (7.5+ magnitude) in hundreds of years. They consider that this swarm has a 1-5% chance of being a foreshock to a major event. The San Andreas is a complicated piece of work. It slices across California, through Thousand Palms, San Bernardino, Palmdale, the central Coast Ranges, Santa Cruz, Daly City, and Mendocino, and despite what the ridiculous TV movies tell you, we aren't going to fall into the sea. At least, not yet. Wait around for 20-30 million years, and Baja may be an island out in the Pacific. The land is moving northwest an average of 2 inches per year, but the actual motion is more like 10-20 feet during earthquakes every century or two. Our big earthquakes occur on three discrete areas of the fault, in the north from San Juan Bautista to Mendocino (site of the 1906 event), from Parkfield to Cajon Pass (site of an equally large ~7.8 event in 1857), and from Cajon Pass to Salton Sea (an area that has not had a big event in maybe 300 years). Some overlap occurs sometimes, especially around Cajon Pass. 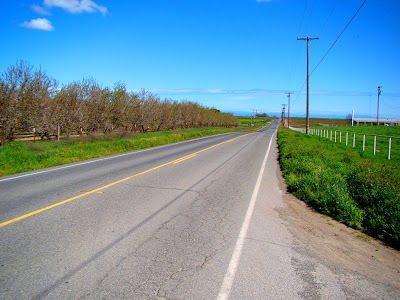 An area from Parkfield to San Juan Bautista creeps a little bit every year without producing major quakes. And Parkfield has magnitude 6 quakes roughly every 23 years or so, although the last one (in 2004) came about 18 years late. Each major section of the fault has an average recurrence interval of around 150 years, but events cluster a bit with time gaps of 90 to 300 years (and I will gladly correct these numbers; they're a few years old and lots of research continues). You may have heard of the great Shakeout earthquake drill that took place a few months ago in Southern California. They did it for a reason. Large earthquakes ARE coming, SOMEDAY, and if you choose to live in California you need to be ready. When one takes place, the power and water are going to be out, maybe for days or weeks. Make sure you have emergency supplies of water, food, and batteries. Know what to do during the quake; where to take shelter, how to do basic first aid, how to help others. Have a plan for contacting other family members, as local telephone service will be disrupted. Save the phones for 911 calls. Make a person outside the region a point of contact if you are separated from other family members and can't contact them directly. It happens that I live in Northern California, where the San Andreas fault is considered slightly less of a threat for no good reason other than that it has been less time since it last rumbled. But lest I become complacent, there was a 4+ magnitude quake near San Jose this morning, near where a 5.6 quake hit last year, on the Hayward fault. The Hayward/Calaveras fault system is sort of a wild card in the earthquake game, less well-known, but capable of much mayhem. There was a "Great San Francisco Quake" years before the "Great San Francisco Quake" of 1906. It was in 1868, and occurred on the Hayward fault, killing two dozen people. Seismologists fear a large quake on the Hayward almost more than the San Andreas, as it passes through a more populated region, and will have more of a direct effect on the levees of the Sacramento Delta. Oh, yes. The Delta. Hundreds of fatalities will be bad enough, but one of the greatest vulnerabilities in California is the system of century-old levees that keep the three dozen islands of the delta from flooding. They are below sea level today because of soil loss from winds, from soil compaction, and from oxidation of the organic material in the soil. Some lie 25 feet below sea level. It's not so much the flooding itself, but the fact that the flooding will be from salt water drawn out of San Francisco Bay. The California Water Project draws a massive amount of water from the delta, and if the islands flood, fresh water will be unavailable. This is the domestic water source for something like two-thirds of the state's population, and it may be cut-off for a year or more. Make no mistake: I am not making any predictions in this post. At all. But mom, sis, dad, son, daughter, you do live next to various faults in central and southern California, so pay attention to whatever news comes out of these quakes in the next few weeks! Quakes are a way of life in California, but in the end, I would rather live here rather than just about any place in the world. Earthquakes and faulting cause damage, it is true, but the spectacular scenery of our state is also the result of a long geologic history of fault activity. You can have your volcanoes, floods, hurricanes, tornadoes, and ice storms: I'll take the occasional quake any day! Today's photo is a section of the San Andreas fault where it crosses I-5 at Fort Tejon at the top of the Grapevine. The fault runs up the center of the photo, and over the distant pass (the snowy flank of Frasier Mtn is on the left side). These straight valleys, eroded out of the weak rock in the fault zone are called linear valleys. I hear word that the Omnibus Wilderness Bill has finally passed Congress. It will protect some incredible areas totaling around 2 million acres in nine states, including some of my favorite places in California. These include Redwood Canyon in Sequoia/Kings Canyon National Park, which includes a huge Sequoia tree grove, and the largest cavern in California: Lilburn Cave, which has something like fourteen miles of passageways (someone can correct me on the details). It also provides permanent protection for White Mountain Peak and the Ancient Bristlecone Forest (the world's oldest trees) in the mountains east of the Sierra Nevada, and for desert wilderness in Riverside (San Jacinto Mountains and Cahuilla Mountain) and Los Angeles County (northern San Gabriel Mountains). These bills were bipartisan efforts, but were held up for years by a handful of senators and representatives. I am so gratified to see these precious lands receive the protection they deserve. The Ever-Present T-shirt and Logo: Entire life, philosophy and travels are displayed prominently on chest or back. Same function in general as bumper stickers on R.V.'s. Belt and Buckle: Pants fit o.k., but samples tend to pull pants down, and something is needed to carry a rock hammer. Deep Pockets: (not in the legal sense; geologists are both poor, and chintzy with money) Full of specimens. Keys and wallet usually carried in hands, only to be lost on sand dunes or inside of locked vans. Assorted Scars and Bandages: Mashed fingers, scraped knees, and contusions from flying particles of rock constitute a rite of passage for most field geologists. Rock Hammer: for specimen collecting, fighting off deerflies, self-defense, etc. Used in certain quasi-religious ceremonies (Such as bringing dead vans back to life). Muscular, tanned legs: from hill climbing, rock scrambling, climbing in and out of vans. Shoelaces: Usually knotted and broken: "wasn't that on the equipment list?" Vibram Soles: for traction on rocks, mud, snow, and spilled oatmeal. Ironclad Bladders: (not pictured) For 300 mile drives to geologic localities without stops. Eyes: Full of wisdom; but often confused: "What the heck is this?" A bit of a confession on the genesis of the people...this was my first honest attempt at drawing pictures of persons who weren't stick figures. I used ink and everything, and when I presented the first draft to the geology club, there was a protest from the women in the group. They grabbed some white-out, and adjusted the woman's torso to a smaller size, and the waist and thighs a bit bigger. They said I needed to "get real". They didn't change the guy at all, though. Greetings from California! We've reached the vernal equinox, when the earth is situated in such a way that the day and night are of equal length. 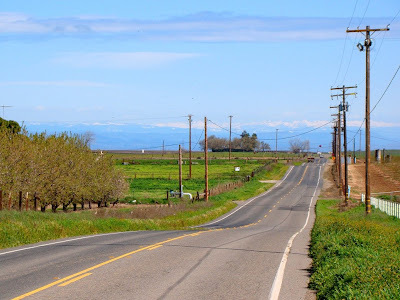 The sun is higher in the sky and the days are getting warmer and longer, and plants are reawakening and sprouting in the Sierra Nevada foothills. We were hit with wildfire tragedy last fall in the Yosemite region, with tens of thousands of acres along the Merced River being incinerated. 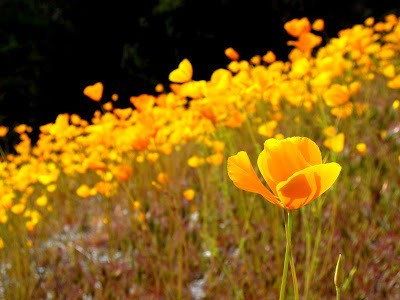 It was ugly then, but with a wet February, the Golden Poppies are taking over the slopes like they haven't in many years. We had a geology class in the Mother Lode last weekend, following historic Highway 49 from Mariposa to Jamestown. We did, in fact, look for and talk about the rocks and minerals that are the source of the gold that fed the massive rush in 1848 and 1849, but aside from a spectacular gold specimen in the museum at Mariposa, we didn't find any. Except for the gold that mantled the slopes along the river! 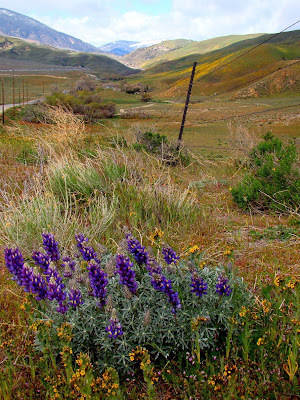 Check the Yosemite blog for some occasional updates on the wildflowers in the Sierra Nevada. Callan Bentley at NOVA Geoblog ordered us into a meme on the topic of ten things we think geology majors should know. His rule was that we couldn't use any items already mentioned. Since I'm coming late to the meme and all the good answers are taken (So far Mel at Ripples in Sand, Chris at GoodSchist, Eric at The Dynamic Earth , Lockwood at Outside the Interzone, Bryan at In Terra Veritas, and Kim have added their top ten already), and because people played fast and loose with the rules on my wedge contribution last month, I'm probably gonna break some rules now, primarily because I haven't had time to read all of them yet. OK, actually it is because I am coming with a different point of view about what geologists should know. It's not the job skills and technical expertise, which of course are necessary and desired, but the face we geologists present to the world as teachers and interpreters of earth science and geology. At one time or another, a person will find out you are a geologist, and they will want to know something from you. It'll be a rock, a fossil, a question about something happening in the news. We are the ambassadors of our science. We all need to be ready for these questions! 1) Know your dinosaurs: Better even than the average eight-year old. Don't just learn the classic plastic toy-in-a-kit types. Go beyond even the Jurassic Park dinosaurs. You need to communicate to people that the world of the dinosaurs was an ecosystem with hundreds of species already discovered, with more being found every year. Even better, know about the mammal-like reptiles, who were almost diverse as the dinos. And know the Cenozoic mammals, better than the kids who've seen "Ice Age". On the other hand, sometimes there are surprises. I got a series of calls from a person who had found what she called some petrified wood along our local river. I didn't take her seriously, of course, because there just isn't any petrified wood there, but she persisted and finally brought it by. It wasn't petrified wood at all, it was a section of a wooly mammoth tusk! 4) Learn to say why "this piece of (slag, vesicular basalt, magnetite) is not a meteorite": this is the closest I am going to come to sarcasm, but this is the most common reason for an unsolicited visit to my office. And people will seriously say "Are you sure? Who else can I talk to who will tell me the truth?". 5. More seriously, be able to explain clearly and concisely the geological hazards that threaten your region. Without exaggeration. One fine day, an earthquake, a flood, an eruption, a landslide will take place near by, and you will be the one who gets the phone call from an anxious reporter who has already written an overwrought story, and just needs you to confirm his or her misconceptions. I once tried to explain the concept of earthquake magnitude, and how there was only one magnitude of a quake, but that intensity was different depending on the damage and people's perception of the shaking. The article the next day said the quake had an "intensity of magnitude 4.5". 6. Be able to explain science and the scientific method: people often do not understand how science works, and there is a frustrating tendency to confuse the meaning of "theory". They may know how an auto technician may follow a process to narrow down the cause of a leak in the AC system of your car, and they know how a doctor uses symptons to be led to the possible cause of a disease, but they don't realize that scientic research follows the same process. We often don't know what we will find, and we don't know a truth and then try to gather evidence to prove it. 7. Be able to explain the theory of evolution, and to do it in soundbites. The creation-science people have been successful in the society at large because they boil huge and complex controversies into short and sometimes sarcastic bits. Don't be sarcastic, and don't be long-winded. And do not be arrogant; it feeds into the wrong stereotype. 8. Be able to explain how we know the age of the earth and the timing of significant events in the history of the earth. This is a huge necessity because the person asking about this and evolution is probably concerned about some aspect of their religious beliefs. To be honest, when faith is involved, you cannot expect to change someone's mind, but if you treat someone with respect and patience, there will be more room for understanding. 9. Be able to identify and explain the origin of the rocks found in your area. People want to know how their treasures formed. 10. Understand how the political process operates in your region: politicians know very little about geology, and sometimes there are proposals that sound good to most people, but would be foolish from a geological point of view: building on river floodplains or on unstable slopes would be an example. There will be times when a lone voice of reason will need to speak up. Be ready to present complex geological topics in a straightforward manner. 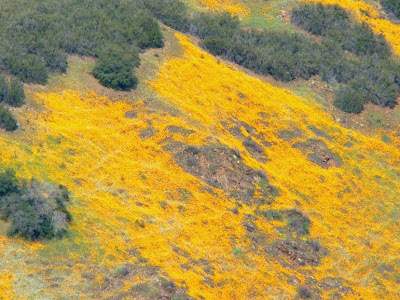 Ever Wished for a Guide to the Geology of Southern California? 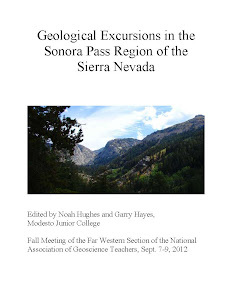 Speaking of places I once lived, you can all have a chance to see and learn about the geology of Southern California at the meeting of the National Association of Geoscience Teachers, Far West Section, taking place on April 17-19 at Mt. San Antonio College in Walnut California. These meetings are a great place to meet students and teachers of geology from California, Hawaii and Nevada, and represent a grand opportunity to learn about the geology of the region from some experts. The meetings are inexpensive, and the organizers have also made arrangements for discounted rates at local hotels. 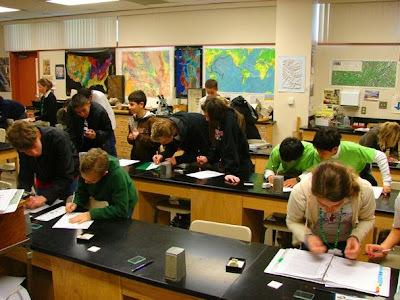 Field trips will explore evidence for Tertiary floodplains, oceans, & volcanoes in the Santa Monica Mountains; Martian analogs in the Mojave Desert; geology of the Conejo Valley & Western Santa Monica Mountains, Ventura County; natural hazards in the eastern San Gabriel Mountains, and engineering geology on the Palos Verdes Peninsula. Conference attendees will also receive a really nice guidebook containing all of the field trip narratives. Other activities at the conference will include seminars on teaching college-level earth science to high school students, the science of global warming, and strategies for teaching K-12 students about earthquakes in their area. There will also be a walking tour of wildlife sanctuary at Mt. San Antonio College. Information and registration forms for the conference can be found on the Far West Section website at http://nagt-fws.org/. I am a past president of the section and the current webmaster, and I can attest to the value of these meetings. Much of whatever success I have had at teaching can be attributed to ideas and inspirations I have received from interacting with the hundred or so teachers and students that I meet at these conferences. And they're fun! Anyone with an interest in geology and education is encouraged to join us (non-members are welcome), and if you live outside the region, this is a great way to see some interesting west-coast geology. Ontario International Airport is just a few miles away from the meeting site, and I would be glad to answer any questions long-distance travelers might have about getting around southern California. And heck, I would love to meet some fellow bloggers and blog-readers! The mountains surrounding the Los Angeles basin are spectacular treasures that are not really well-known outside the region. 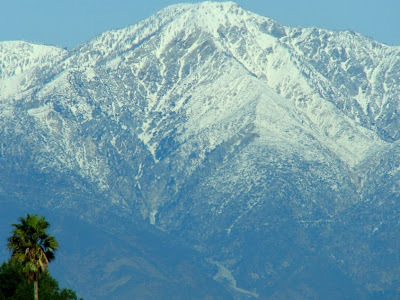 The picture is Cucamonga Peak (8,859 feet) at the eastern end of the San Gabriel Mountains from the vicinity of Ontario, California. One of the field trips at the conference will include an exploration of Icehouse Canyon which is hidden deep on the north flank of the mountain (and yes, I know that Lytle Creek is really the first canyon north of it; Icehouse is two ridges over). Picture is courtesy of Susan Hayes. It was birthday week, and in a series of delicate maneuvers and subtly placed hints, I landed a brand new camera (think "subtle" as in Ralphie and the BB Gun in "Christmas Story"). I headed out into the countryside and took a couple of pictures. And had one of those epiphanies that sometimes happens when in wide open spaces. I didn't know my place! I've always lived in places with mountains nearby. Mountains provide a person with a sense of direction, a sense of "up", a sense of location. In my ancestral homeland of Southern California, the San Gabriel Mountains rise up dramatically from the valley floor, with vertical relief of as much as 8,000 or 9,000 feet in the space of a few miles. They were pushed up by compressional forces along a bend in the San Andreas fault, and according to one analysis I heard of, they are the steepest mountains in the world when computing the average slope. I had no trouble believing this statistic, given my experiences in attempting cross-country travel as a youth. I remember climbing mountains at times by gripping and literally hanging onto manzanita and other shrubs. Oftentimes the only places flat enough to build habitations are on the tops of landslide deposits, or on the lake sediments trapped behind said landslide deposits (Crystal Lake and Mt. Baldy Village are examples). 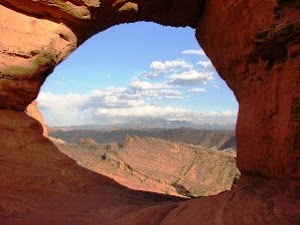 Later, my life journey took me to Reno, Nevada, where the landscape is dominated by the Sierra Nevada and the barren mountains of the Basin and Range Province. Again, one never had to guess a direction; Grapevine Mountain was north, Mt. Rose was south. One immediately knew about the rain shadow effect, as the ponderosa forests gave way to sage brush slopes along a distinct line. One more move brought me to Santa Barbara, another place where the landscape is highly directional. The city is squeezed onto a narrow coastal plain in the Transverse Ranges, one of the few mountain systems in the entire United States that has an east-west orientation. Thus, all directions were towards the mountains (north), towards the sea and the Channel Islands (south), towards Ventura and LA (east), and west towards Japan (after Point Conception, anyway). Eventually I landed and set down roots in the Central Valley of California (or the Great Valley, as we sometimes like to call it). It was during my first visit, the job interview appointment, that I first met up with one of the directional realities. The valley is flat, flat, flat, and the concept of north-south-east-west has almost no meaning. Instead, direction is provided by the railroads, the lifeblood of the local economy. Since the railroads run in a north-west/south-east direction, the cities were originally laid out with the same orientation. Thus, downtown Modesto has a diagonal grid pattern that becomes dominately north-south only in the newer neighborhoods. Giving street directions can be a nightmare! The bicyclists in the recent AmGen race through town must have found it confusing. I certainly did. When I needed to put on a suit and tie for the interview, I drove what I thought was east to a fast-food place. I was going north. To this day, I cannot walk outside and point north without thinking carefully about it. Inside the classroom, I cannot point correctly east towards the Sierra Nevada. Sometimes it takes two guesses. This from a person who in all his life needed only a compass and a topo map to pinpoint his location faster and better than a GPS unit. 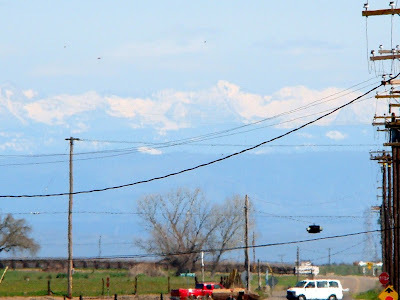 My new camera has a nice zoom function, and I took a picture of one of the typical landscapes found near my small farm town outside Modesto. In the first, one can see the orchards and farmlands, and the barest hint that mountains may lie in the distance. 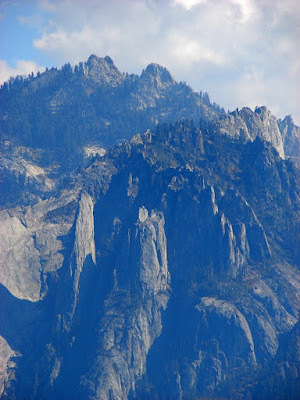 Although the Sierra Nevada is a dramatic and very high mountain range, it rises gently from the west and reaches the crest some 40-50 miles away. With the zoom, in the second picture, the mountains become an obvious presence (this would be "east"). With the highest digital and optical zoom settings, the third picture reveals features of the mountains (through the heat waves). And with that, there was a shock. I didn't know the mountains I was looking at! I used to know the name and elevation of every mountain within sight of my various homes through the years, but I'm gonna need binoculars and a map to figure these peaks out. Is the Kid Right or What? And I'm talking about Jeffrey, not Danae. I'd reproduce the comic but would probably be in copyright trouble for it. Wiley Miller ooften hits the nail on the head in the science-political world. I seriously remember as a kid playing with the hose in mom's rose garden and getting absolutely captivated by the patterns of evolution and deposition in the garden soil. And I have quickly established who the best potential geology majors are by watching how they get trapped in lab by stream tables! Hunting for words. It is sometimes hard to avoid using biblical metaphors when describing certain elements in the story of the earth. Whatever else you may feel about it, there is no doubt that much of the imagery can evoke powerful emotions: apocalypse, Armageddon, rivers flowing red with blood, a rain of fire and brimstone...God's judgement upon the transgressors. Is the word catastrophe enough? Disaster? Yes, maybe disaster. In the original Greek, it means "bad star", presumably referring to the bad omens seen in astronomical phenomena like comets and meteor storms. Yes, maybe disaster is the word I am looking for. And a passage from Revelations 21:1 seems strangely appropriate: "And I saw a new heaven and a new earth: for the first heaven and the first earth were passed away; and there was no more sea." I've been working on (well, off and on) a geological exploration through the Colorado Plateau region. I had no idea it would go on for so long, and with so many entries (since July, with 48 posts so far; if you are a glutton for punishment you can start catching up with the story here). Sometimes you just start out and then find your subject matter is just so rich, and the Colorado Plateau is certainly rich. In my last post a few weeks ago, we had reached the end of the Cretaceous Period, right about 65 million years ago. And I hinted that everything would change. On the Colorado Plateau, everything changed in a huge way. And thus my search (above) for the right words, the right imagery. Disaster. For many, the world did end at the close of the Cretaceous. Anywhere from half to two-thirds of the species of animals and plants of the world disappeared forever. The dinosaurs were the most familiar victims, but there were many others, including plants, plankton, marine invertebrates, large sea-going reptiles, and a number of mammals. Many of the survivors were freshwater vertebrates with low food needs (crocodiles and the like), or who could hibernate (mammals), which suggests a nearly instantaneous event that lasted just a few years (although, it should be noted, this is a contested view; some argue it lasted thousands or hundreds of thousands of years). The cause? A giant asteroid (the"bad star")? A lot of researchers think so; a great deal of evidence exists for this hypothesis. Massive volcanism? Certainly a lot of lava poured from the ground in India right about this time (the Deccan Traps). Changes of sea level? The arguments continue, but something happened, something profound. Another huge change took place in the plateau that makes the biblical passage from Revelations particularly resonant: the seas left the region for the final time. In fact, the entire region began to rise and massive mountains formed around the margins. Ultimately the plateau may have been uplifted as much as three miles. And erosion began. Not just a little, but a vast quarrying of nearly two billion years of sediments. Thousands of cubic miles of rock and sand simply washed away. Given the high elevation of the region today, the massive destruction of rock is destined to continue for millions of years, and eventually all that will remain will be a low plain eroded into the most ancient continental rocks. In other words, we are fortunate to be living in the times we have, where we can see, understand (in our limited way), and appreciate the history of this fascinating region. It is humbling in a way to consider that all the special places of the plateau country, the Grand Canyon, Zion, Arches, Canyonlands, Capitol Reef, all of these places are ultimately temporary. At the end of the Cretaceous Period, the old world did pass away, but a new world emerged from the ashes. There was a new landscape, one of lakes, mountains and plateaus. And there were a great many new animals inhabiting the ecosytem, totally new creatures that had taken advantage of the disappearance of the giant reptiles. It was the Cenozoic Era. The story continues! 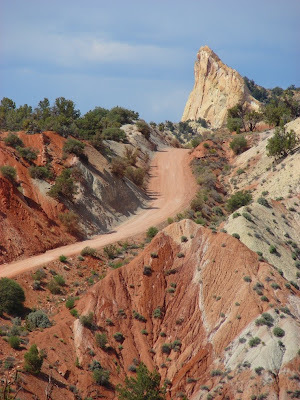 The picture today is the Comb Ridge Monocline, a huge rip in the earth's crust that formed during the Laramide Orogeny early in the Cenozoic Era. Not really a geology post, but this is about CLAYmation, and clay is certainly a geological material, and it is being put to excellent and creative use by some of my very talented and creative cousins. And years ago, Shel went on a few trips with me where I talked lots of geology. I've made the geology connection, so what's up? It turns out that Shel's production "Gerald's Last Day" has won a number of short film awards, and is now a finalist on the Delta Fly-In Movies Film Festival. I would love to encourage you to give their film a look and a vote (the others are pretty good too, I guess). I even know some of the characters (at least the people providing their voices!). What is it With Kids Today? Actually, this isn't a rant, it's a compliment. I just got back from judging the "Fossils" event of our regional Science Olympiad, and as always, I am comforted about the future by seeing hundreds of our local junior and senior high school students competing not for a football or basketball championship, but for a SCIENCE trophy. And they work hard for their laurels, designing bridges out of toothpicks or straws, miniature cars, bottle rockets, and egg drop contraptions. A lot of the students compete in the trenches, in those events that don't get a lot of attention, but require a lot of scientific discipline, like physics, chemistry, environmental science, geography, and in my discipline, geology (rocks and minerals, fossils). They don't always know all the answers, but they give it a huge effort. And they are enthusiastic: many of the teams produce team shirts and hats, and the cheers at the awards ceremony rival anything I've heard at any football game. I also have to salute the hundred or more volunteers that make the Olympiad work; the event is supported by the local school districts, but the volunteers do the footwork, judging the events, tabulating the scores, providing lunches, and keeping things from descending into chaos. It's also a chance sometimes to see my former students in their present-day role as teachers and mentors to these students. The top schools overall earn the chance to advance to the state finals, and then to the national finals. If only we had a "Science" section of our local paper, and that people recognized the value of scientific and academic competition as much as they do sports achievements. Is there an Olympiad in your region? Do you volunteer? It would be great if all the students in the country had a chance to compete in this sort of thing. If you want to learn more, check out the National Science Olympiad Website. I was grading papers tonight. Given that I fall asleep easily while doing this means that I need distractions, so I was watching an old episode of Star Trek: The Next Generation. In the first season episode "Home Soil" the good doctor Beverly Crusher delivered this stunner of a statement about "science". As much as Star Trek was a half-decent attempt at good science fiction (don't ask a physicist, maybe), the statement above represents the kind of television/movie silliness that science teachers have fought against for decades: a fundamental misunderstanding of how we gain knowledge in an objective manner. The term "theory" has been misused for a long time, I suppose because it is harder to get actors to say "hypothesis" in a convincing manner. And to get the science right means cluttering up a crisp script where everything has to happen in the 47 minutes or so that isn't commercials in an hour-long broadcast (and yes, I know all about 47 and Star Trek). How many times have you heard someone say that an explanation is "just a theory"? Or, "here's my theory about why something happened the way it did". These statements only work when the word "theory" is replaced by "hypothesis". Theories, on the other hand, are models that are accepted and understood by scientists as to the way the universe works: atoms are theoretical; so is gravity. And evolution. We don't "believe" in atoms or evolution, we accept them on the basis of years of research and exploration. And the world and universe behave exactly as if these phenomena are in operation. One can choose not to believe in gravity, but trip over a rock and you will land on your face anyway. In any case, the Creation-Science/Intelligent Design movements use a method much like that at the start of the post: Decide upon the truth, and garner all the evidence that supports this truth. You can try to call this approach "science", but it is not science. "We have to do this the scientific way...."
"Observe the phenomena, collect evidence and organize all the data, formulate as many possible explanations (hypotheses) as we can, and design tests that can disprove our hypotheses. If one explanation is finally supported by the evidence and cannot be disproven, we will accept the explanation and act accordingly, knowing even then that our explanation could be disproven if new evidence emerges". Sorry script-writers, science is sometimes hard to jam into a sentence (and this, among many reasons, is why I am not writing scripts for a living). I welcome any of my readers to try to make this more succinct. But I wish Hollywood would try a bit harder; it would be better for us all.